Last November boxing got exactly the kind of sport it needs to have, in order to flourish. When Andre Ward challenged Sergey Kovalev, the WBO, WBA and IBF light heavyweight belts were all on the line. But those titles were secondary. Ward vs. Kovalev was a true example of the best vs. the best. Both men were undefeated, top three pound-for-pound stars. Ward was an Olympic gold medalist and cleaned out the super middleweight division before rising to 175 pounds. Kovalev has created an aura of dominance, earning a reputation as one of the sport’s most dangerous punchers. The fight itself lived up to expectations. Kovalev knocked down Ward early. Ward battled back and poured on the pressure. 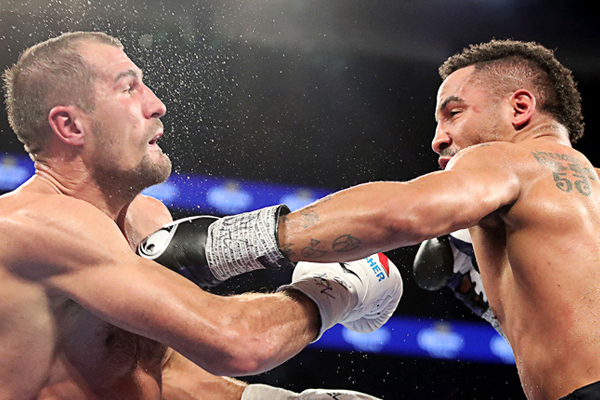 Kovalev dug in and fought on even terms with Ward down the stretch. Ward escaped with the narrowest of decisions, winning by a mere point, 114-113. It has been an unpopular decision, but not an unreasonable one. I had Kovalev winning by the same score, giving each fighter six rounds, leaving Kovalev the winner by virtue of his knockdown. But I have no problem seeing seven rounds that could go to Ward, giving him the 114-113 edge instead. This decision was no robbery. But a fight this close demands a rematch. Ward won with the judges and deserves to have that win registered in the record books for all time. But when you beat a reigning champion by such a hotly contested decision, you owe the champ a return bout. Ward has been less than decisive about his committment to giving Kovalev that rematch. I understand the need for him to play his cards close, for the sake of future negotiations. But if Ward fights anybody other than Kovalev next, it will be a disappointment. Ward has floated the possibility of retirement, as well. That is a decision I can respect. He is still very much in his prime, coming off the greatest performance of his career. But boxing is a dangerous sport and Ward has a nice, growing family. He has no doubt earned enough by now to keep them comfortable and well cared for.